We met Don and Denise years ago because they are good friends of our neighbors Deb and Armo. We’ve all spent time together over dinners, barbecues, and backyard bonfires. It’s been nice being the “friends of friends” and sharing in the ups and downs of life with them. One of the funniest memories I have of them was from a yard sale that they held. At the curb there was a box of stuff and in front of it was a sign that said “Free or Best Offer.” That’s classic, isn’t it? Denise is an artist specializing in viscosity monoprinting. She also helps others create art in the workshops that she holds in monoprinting, book making, and printing with paste paper. You can see some of her work displayed at her website “Drawing on the Dream.” Though I’ve never taken a class from her I know that Denise would be a good teacher because I’ve listened to her encouraging beginning artists. That is so important because beginners need all the encouragement they can get – and we are all beginners at some point in our lives. Don is an expert on fire management and his official title is “Incident Information Officer”. Don has worked for the for US Forest Service and then for the Bureau of Land Management. A few years ago I asked for his help with a fire safety plan that I was developing for Sanctuary One located in southern Oregon. My main my concern was how to safely evacuate the animals in the event of a wildfire. Don suggested that I should consider some other possibilities as evacuating animals can be very difficult. He advised the sanctuary staff talk to their neighbors so that they could share resources and ideas and said they should create a phone tree in case of emergencies. He also advocated sheltering in place so that the dangers of evacuation might be avoided. 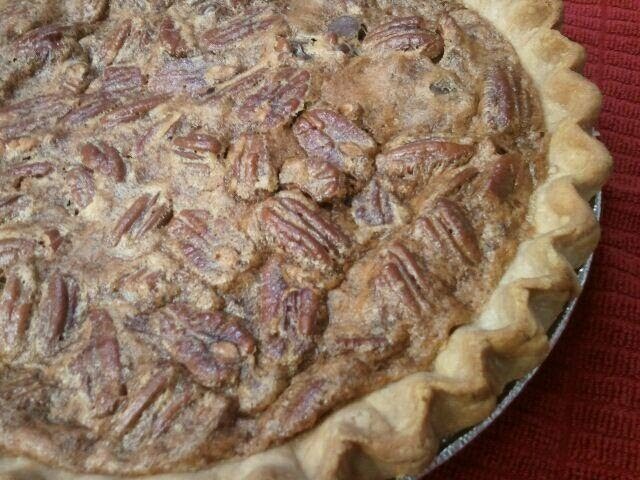 Since Denise was raised in Georgia, I made them a southern favorite, Pecan Pie, but with a hint of dark chocolate for added sweetness. It’s a small gift to thank them both for their friendship and support over the years. A few days ago I received an email from Robert Casserly, the director of Sanctuary One, the first non-profit care farm in the United States. 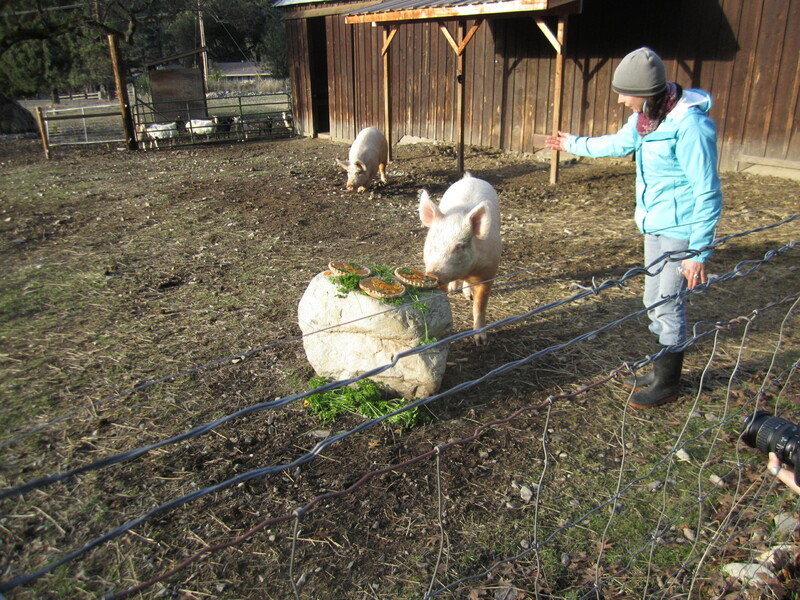 Care farms are farms where people, animals, and the earth work together for mutual healing. Sanctuary One is located in the Applegate region of southern Oregon. One pie didn’t seem quite enough for two pigs and so I baked three smaller pies using mashed pumpkin, potatoes, and carrots. 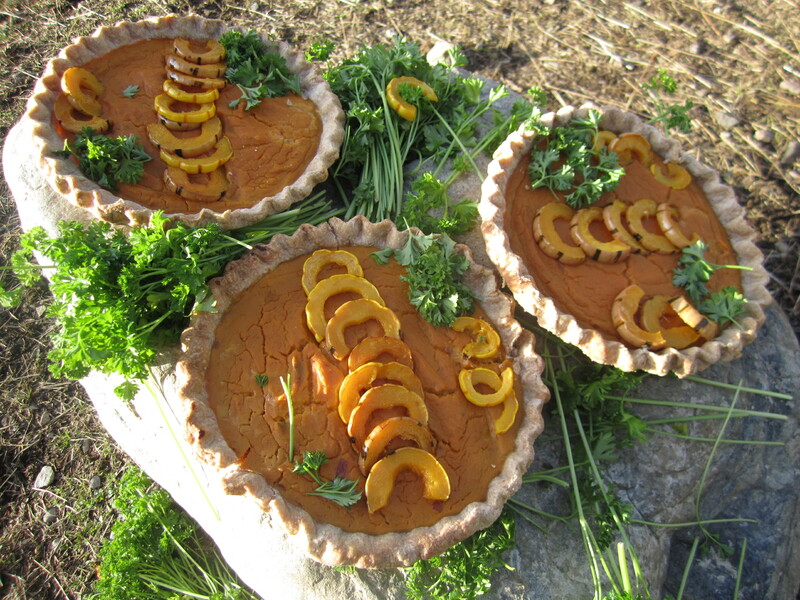 I wanted to make them extra special and so I cooked off some delicata squash as garnish and arranged it and some parsley atop the finished pies. Then I drove out to the Applegate to deliver the pies. I was accompanied on this trip by Laurel, a young lady who wanted to videotape this pie delivery. 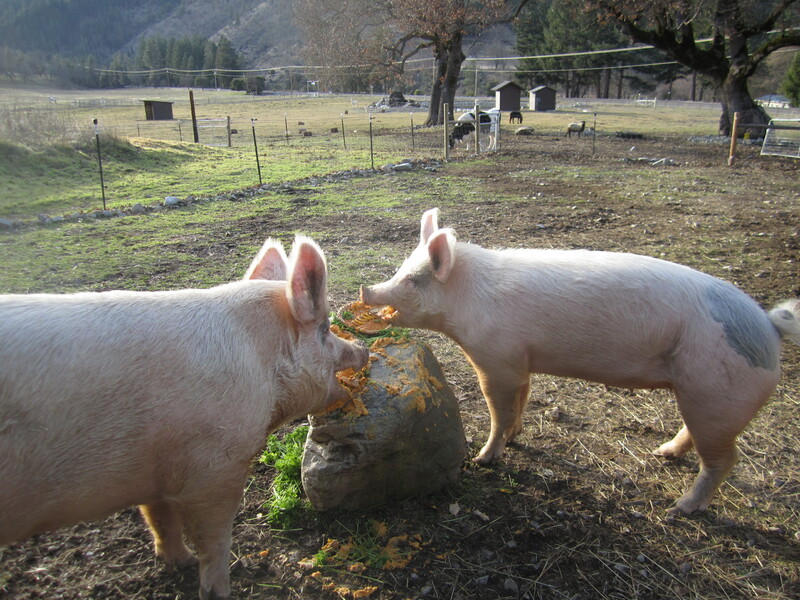 Then Sansa let Lisa and Lulu out of the barn and those pigs actually ran to the boulder and began slurping up the pies. It was a bit of a frenzy and they were enjoying every minute of it! In no time at all their happy faces were smeared with pumpkin and the only thing that wasn’t devoured was the parsley garnishing the pies. Once Lisa and Lulu were led back into the barn, the goats came over to the boulder and ate up what was left. It didn’t seem fair that the goats hadn’t had a pie of their own, and that got me to thinking that there just might be another pie day at Sanctuary One with enough pie for all of the animals. I imagine that will be a sight to behold! 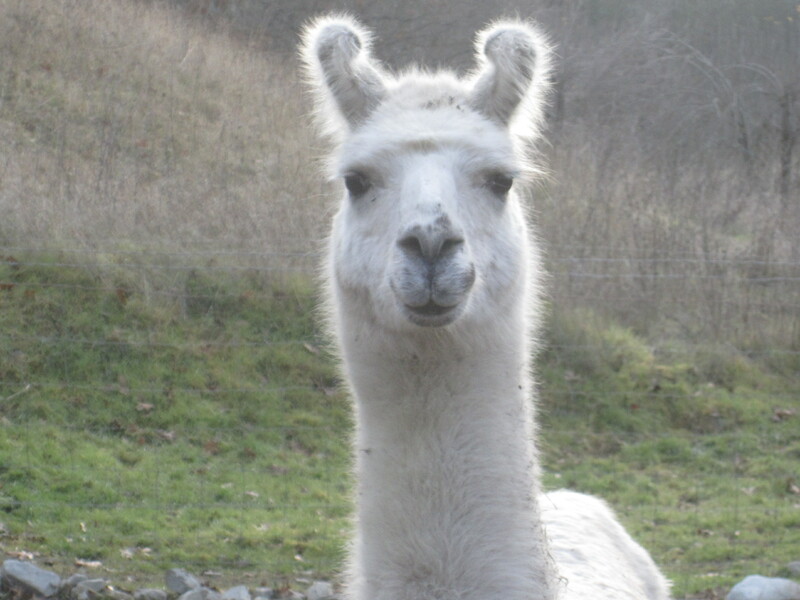 For a list of ways that you can help Sanctuary One in its mission, please click here.